The Philippines is the greatest supplier of abaca fiber around the world. It supplies 85% of the needed abaca fiber around the globe. This is the reason why abaca fiber is also called Manila hemp. Abaca is not a hemp but since hemp was the main source of fibers for centuries, the abaca fiber was named Manila hemp. Abaca has been cultivated in the Philippines since the 1500s and became known worldwide in the 1800s mainly used as ropes in ship rigging. 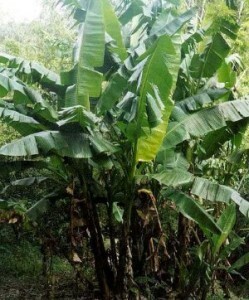 It is abundantly growing in tropical countries such as Philippines. The Eastern Visayas is the widest abaca supplier in the country. Second is the Bicol region. It came from banana family, but unlike banana trees that bear flowers and fruits, abaca has less edible fruit. It is considered to be one of the strongest natural fibers in the world. The abaca plant grows up to twenty feet when mature. About 2 to 4 times a year the trunk is cut down above the roots to harvest the fibers. New sprouts will grow from the roots after cutting. Leaf sheaths are then stripped and pulp is scrapped off to get the abaca fiber strands. To make rope, the strands are twisted together. These strands are mainly composed of cellulose, pectin and lignin. This amazingly strong fiber can build various products – be it native or other synthetic materials. Some countries have switched to using abaca fiber instead of other carcinogenic materials that harm human health. This is the reason why the market is increasing for abaca. How do they process abaca fiber? First, cut off the stalk of the abaca plant. The stalk is usually green in color. Next, it will be sliced into quarters lengthwise. You will need a special knife. It will look similar to that of a paper cutting board where the knife is pressed halfway down and is secured in that position. Then, the stalk will be pulled through the knife scrapping off the none filamented materials. This the raw form of abaca. 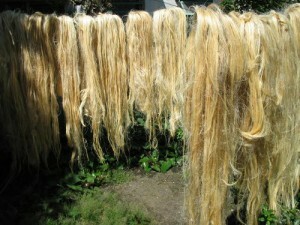 This raw fiber will then be hung up until it is dried. When it is dried, it will be brought to inspection. Abaca has different grades of fibers. The excellent fibers are then separated from the rest. The selected excellent fibers will be combed to remove tangles and other impurities. The excellent exported abaca fibers are used in making tea bags, sausage casings, pill coatings, paper products, surgical masks and insulation for computer chips. As of making native bags, abaca fibers can be dyed in different colors and variety of designs out of these. Abaca fibers do well with native bags because it is strong and will last for a longer use. Abaca fiber is also known to foreign countries as Manila rope. Since the country is the major supplies of abaca, the name refers to the capital city Manila. Manila rope is a type of rope made from manila hemp or abaca fiber.